Western Sandpiper juvenile feeding at Jamaica Bay NWR, Queens, NY. My last Peep Show post features the Western Sandpiper. Often times this peep gets confused with the Semipalmated Sandpiper featured in my last post. There are a few key field marks to look for, particularly during fall migration. First, the Western Sandpiper has a longer bill with a slight droop at the tip. 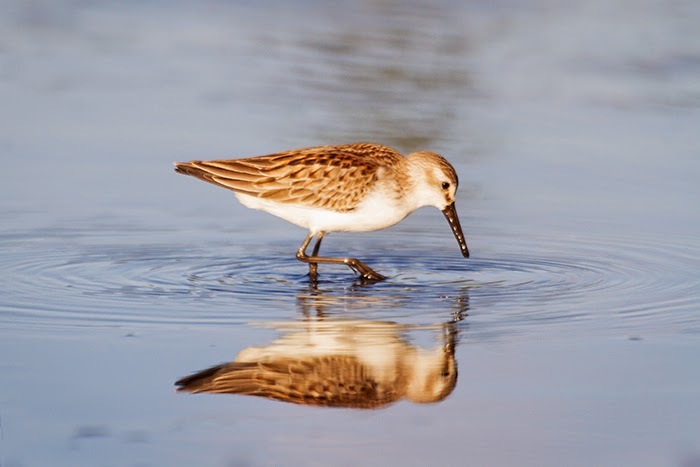 However, the bills of Semipalmated Sandpipers vary quite a bit and there is some overlap at the extremes, so that is not a reliable field mark by itself. Second, the Western Sandpiper's upper scapulars are edged with bright rufous, which contrasts with the more browner tone of the other back and wing feathers as seen here. Semipalmated, particularly fresh juveniles, can have a light rufous or russet wash to the upper back, but it is more extensive and not starkly contrasting with the rest of the feathers. This only applies to juvenile and breeding (alternate) plumaged adult Western Sandpipers. Adult Western Sandpipers in the fall should be completely molted into their winter (basic) plumage by the time they reach the states and are very pale with no scapular marks. However, that can help distinguish them from adult Semipalmated Sandpipers which should still retain at least some of their breeding (alternate) plumage. On a juvenile Western Sandpiper like this bird, the lower scapulars will appear to have a black anchor on them. They also have an overall paler face and breast than Semipalmated Sandpipers which can be quite striking in the field.